The Naomi Schor Lecture Fund was established in 2002 to honor and perpetuate the memory of Professor Schor by bringing to the Yale community distinguished speakers on the broad range of topics represented by her teaching and research. Naomi Schor was a scholar of nineteenth-century French literature and culture, whose writings focused on the novel, but whose interests spanned a much wider area, including feminist theory, women’s and gender studies, the visual arts, interdisciplinary approaches to literature and history and the relationship of universalism human rights, and citizenship to the more particular national ethnic, and immigrant identities of America and France. Guests have included Joan Scott , Françoise Gaspard, Margaret Phelan, Linda Nochlin, Judith Butler, Alice Kaplan, Partrick Weil, Roya Hakakian, Griselda Pollock, Susan Suleiman, Maurie Samuels, and Pierre Saint-Amand. 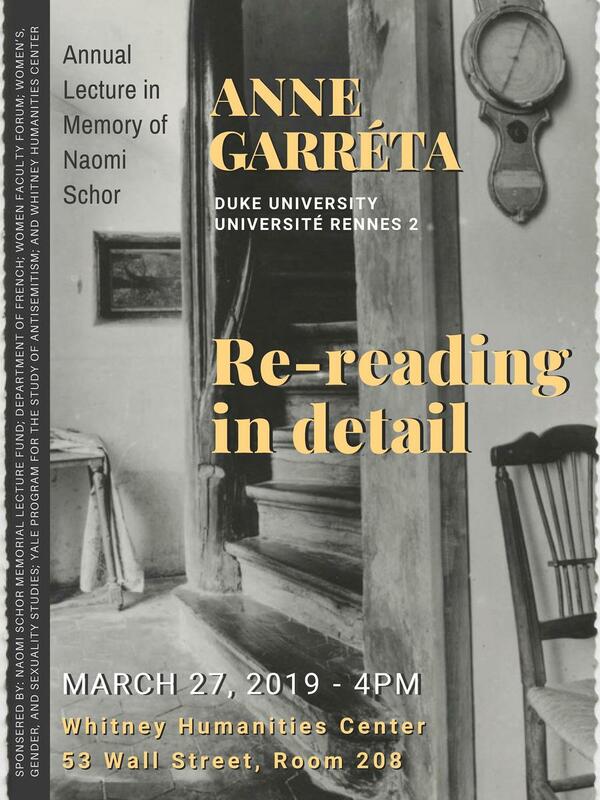 The lectures in Memory of Naomi Schor are sponsored by The Naomi Schor Memorial Lecture Fund, The Deparment of French, The Whitney Humanities Center, The Yale Program for the Study of Antisemitism, The Women Faculty Forum, and The Women’s, Gender, and Sexuality Studies Program.